RAF FAIRFORD, England — General Atomics Aeronautical Systems’ developmental MQ−9B SkyGuardian made the first ever transatlantic flight of a medium-altitude, long endurance aerial drone. 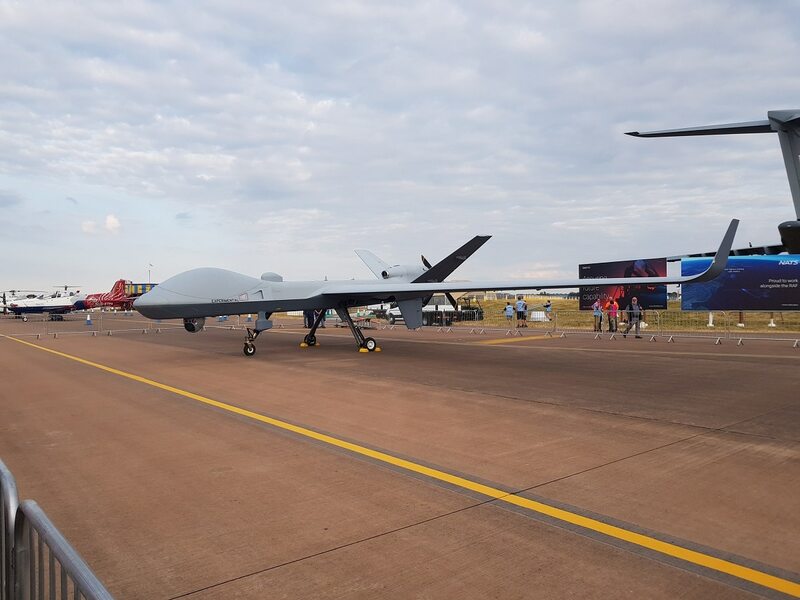 The unmanned aerial vehicle completed touched down at RAF Fairford in the United Kingdom after a 3,760 nautical mile sortie from the U.S. July 11 that began at the Grand Forks test site in North Dakota 24 hours and 2 minutes prior. The journey was the first transatlantic flight of both the SkyGuardian and any MALE UAV, but also the first U.K. appearance of the UAV that the Royal Air Force will operate under its Protector program. Northrop is highlighting the helicopter drone's anti-submarine warfare capability at the Royal International Air Tattoo. The U.K. is the launch customer for SkyGuardian, and the journey to RAF Fairford to take part in the Royal International Air Tattoo (RIAT) ties in with the RAF’s centenary celebrations, as the MQ−9B will be one of the next combat aircraft types delivered to the service. L3 Technologies Communication Systems provided Ku-band satellite communication (SATCOM) to control the UAV throughout the flight with no handover to a control station in the U.K, although Inmarsat Government provided a backup L-band SATCOM capability in case of failure. A line-of-sight ground control station was shipped to Fairford and was responsible for taxiing the aircraft once it had carried out its automatic landing. It flew at approximately 27,000 feet for most of the flight, dropping to 9,000 feet and maintaining a holding pattern near Fairford for some 2 hours ahead of landing, transiting initially via Canada, over to the South of Ireland, and then over Wales before reaching its end destination. Click here to get all of the latest news from the Royal International Air Tattoo. Jonny King, vice-president of GA-ASI UK, told a media briefing at Fairford that the transit demonstrates that the UAV is self-deploying, and the journey was relatively routine for the test aircraft — just with a different landing destination. It has previously flown a sortie of more than 48 hours, King noted, and for the transatlantic flight it was able to fly under the U.S. Federal Aviation Administration’s authorization, with support from the U.K. Civil Aviation Authority that granted an overflight permission for the transit into U.K. airspace. While the U.K. is on record as being the launch customer for the SkyGuardian through its Protector effort, the aircraft is yet to go through certification testing — one of the most distinguishing features of this variant — and will not be delivered to the RAF until the early 2020s. Development and certification contracts for Protector have been signed, but a production contract for the buy is not expected to be signed for some time, the RAF told Defense News. Air Marshal Julian Young, chief of materiel for air, defense equipment and support for the RAF, said that it is expected that Protector will be acquired under two direct commercial sales contracts and two foreign military sales deals with the U.S. government, covering the various elements of development and acquisition. “Protector is one of the most exciting projects I have to deliver,” Young said, adding that it will be a “gamechanger” in its ability to fly alongside manned aircraft under the remit of air traffic control, with the ultimate goal of being able to fly in open airspace alongside uncontrolled aircraft. SkyGuardian has been in test flight for some 18 months so far, King said, adding that the second test aircraft – YBCO2 – will join the first aircraft in test flight in the next month or so. In accordance with the U.K.’s 2015 Strategic Defence and Security Review, the RAF will more than double its MALE UAV capability, which is currently fulfilled by a fleet of 10 Block 1 MQ-9 Reapers, so as few as 21 could be acquired, although 26 is a figure that has been previously touted. The RAF has claimed that integrating UK-made weaponry is a priority for the program, so it will operate MBDA’s Brimstone ground attack missile and Raytheon UK Paveway IV laser-guided bombs, although contracts for these have also not yet been signed. He added that the training capability that the U.K. will use is still undecided on, although the U.K. is open to this taking place domestically or with other partners should another nation elect to acquire aircraft. SkyGuardian will be showcased throughout RIAT before being dismantled and shipped back to the U.S. a week later, King noted.